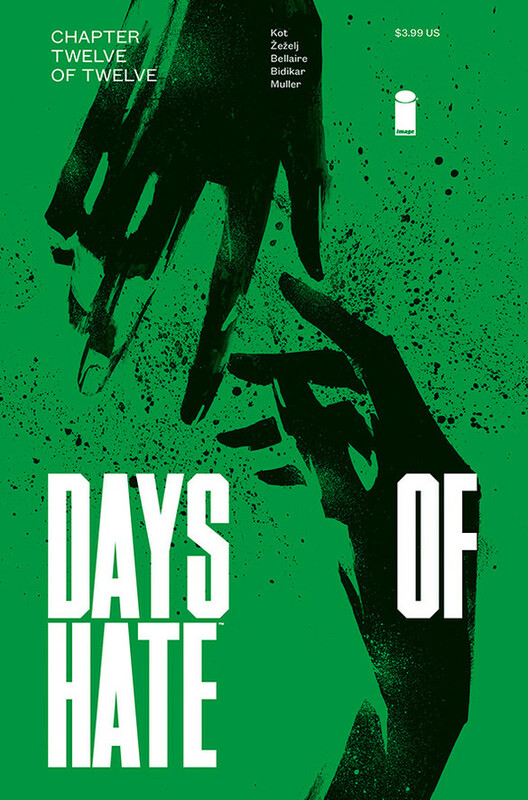 Days of Hate #12 – Before I say anything about how this series ended, I want to take a moment to appreciate the work of artist Danijel Zezelj, one of the most atmospheric and evocative artists working in the business. This is a very quiet issue, and he manages to make the panels suggest dread, even when they are just exterior shots of suburban homes. Ales Kot is a writer I’d lost faith in before this series began a little over a year ago. Some of his work had gotten as self-indulgent as Grant Morrison at his most excessive, without the steady drive of fantastic ideas, while other series of his either ended poorly, or like The Material, just didn’t end. I’d decided that I wasn’t going to bother with Kot anymore (which is why I never read Generation Gone), but then I got suckered into buying this book because Zezelj’s name was attached to it. I was immediately drawn into this look at America a few stops down the road, likely towards the end of Trump’s second term. This series never came out and explicitly stated how the resistance cell that the series centres on works, or what its goals are. Instead, we saw a love triangle play out involving a revolutionary, her ex-wife, and the federal agent that was investigating them. On the side through much of the series is Arvid, the man who gets the centre stage for this final issue. His discussion at the end of this issue helps explain the series, and Kot’s view of history, and it makes a lovely coda to this book. Kot’s recent series The New World was also impressive, but this book has really stuck with me, especially for how little it actually says or shows. It feels like Kot is becoming a more mature and seasoned creator, and now I’m more likely to follow his future creator-owned stuff with anticipation. 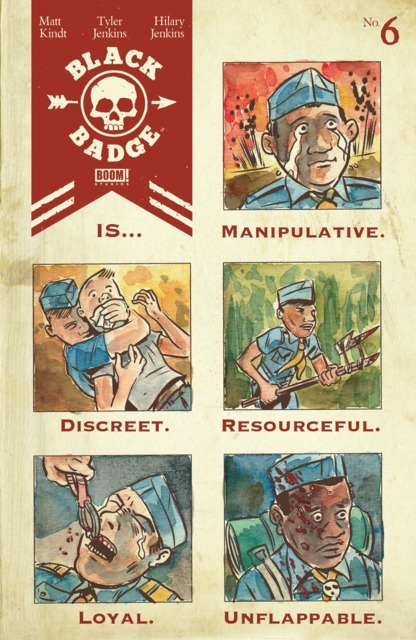 Black Badge #6 – This is a very different issue of Black Badge from the first page, as Matt Kindt and Tyler Jenkins both make the case for the existence of the Pink Badge (an all-female counterpart to the Black Badge) and give us a bit of a look into its history. The Jamboree continues, and when our Black Badge crew falls prisoner to the Pink Badge troop, we learn something surprising about one of the kids that’s really going to upend how the group works. I like this title a great deal, but was also ready for the change in tone that this issue brought. Black Panther #8 – T’Challa runs a mission to steal some vibranium from a freighter, but ends up with tough decisions to make when he finds a massive number of Nameless prisoners on board. Ta-Nehisi Coates’s Star Wars approach to this science fiction series with only the slightest of superhero trappings has been great, and I’m pretty pleased that Kev Walker has joined him as artist. This was another solid chapter. Invaders #1 – I’ve been unimpressed with the heel turn that Marvel has forced on Namor lately, moving him from working with Jean Grey’s X-Men to attacking the surface world and partnering with criminals. When this new Invaders series was launched, and I saw that Chip Zdarsky would be writing it, I had hope that Namor’s changes might be addressed here, and that all would become clear again. It’s not all explained in this issue, but it is obvious that Zdarsky has a plan for Namor, who demonstrates some interesting new abilities, and it is this plan that is the reason why this series even exists. As Namor goes looking to bolster his army, Jim Hammond, the original Human Torch, sets out to write a book about the Invaders, and starts interviewing people who knew Namor during the Second World War. He also convinces Captain America that he needs to go to Namor himself, without the Avengers, to figure out what’s going on with his friend. It’s a good reason for this title to exist, even if it is the opposite of new-reader friendly (I’m glad I got caught up on the Avengers and the Namor one-shot in anticipation of this book). Carlos Magno is a good artist for this book, and Butch Guice is perfect for the flashbacks to the war. I have hopes for this title, and am curious to see what Zdarsky is going to do with a long-time favourite grouping of mine. 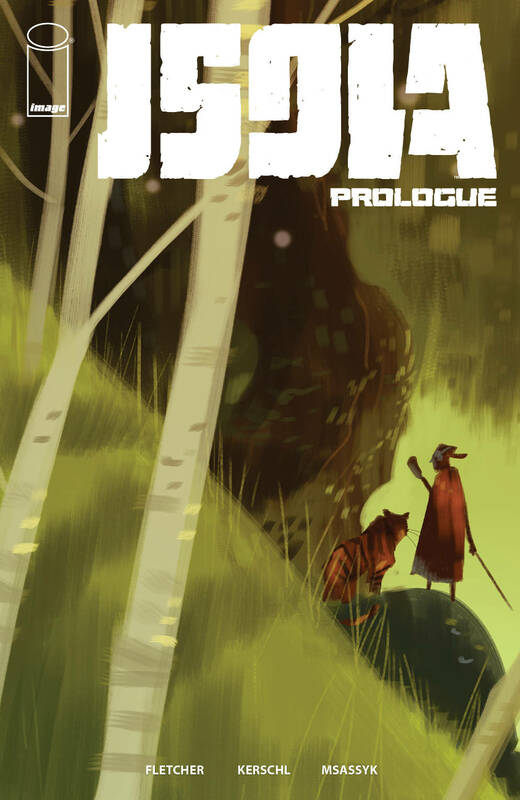 Isola Prologue #1 – When I first read this story, spread out across many issues of Motor Crush, and coming out very sporadically, I couldn’t find myself interested in it at any level. Put together, I’ll admit that Karl Kerschl and Brendan Fletcher did pique my interest a little more, and now I’m considering checking out the first trade. That’s what this was made for, so I guess that worked. Lodger #3 – The mysteries get a little deeper in this issue of this crime series by David and Maria Lapham. We learn a little more about what the “Lodger” did that set Ricky off on her life of seeking revenge, and also see a little more of how he operates, travelling from town to town and leaving chaos behind. This series feels very different from Stray Bullets, but is just as accomplished at drawing me into its story. Uncanny X-Men #10 – It’s hard to talk about this one without spoiling things, but I’ll do my best. I’m disappointed in the way in which this series was handled, taking ten issues to build to this event that still feels kind of rushed and slapped together, while also owing something to House of M, the X-event I hoped would never be revisited. There is some story potential to how this issue leaves things, but I hope that Matthew Rosenberg, the writer remaining with the title, takes his time to do things in a more measured and consistent way. One big problem I have with the way that this ends is that it’s never entirely clear who all answered the call for all the X-Men to converge on X-Man’s position; if the changes in this issue last for more than a few months, there’s the potential for all sorts of continuity problems going forward. Anyway, I like that Marvel is trying to make this series prominent again, I just wish that more care and logic was being put in getting it there. From here, I am curious about how this title, which is going to be featuring Cyclops prominently, is headed, and I intend to pick up the Age of X title written by Thompson and Nadler, but the rest of it doesn’t really interest me. There are too many series coming out of this book, and I question if any of them are going to be important. 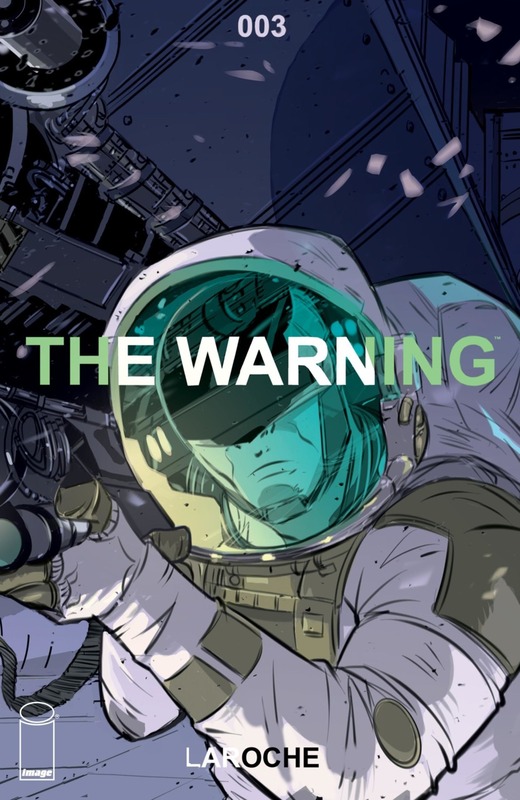 The Warning #3 – Edward Laroche’s new science fiction series doesn’t offer a lot in terms of explanation or characterization, beyond the central character’s musings on reincarnation, but it does give us some very nice European-style images of enhanced military types going about their business, which this issue involves making a move against the large alien complex that is coming through a tear in reality or something. It’s cool. The Wicked + The Divine #41 – It’s another big issue, as Laura frees some captives, some heads get new bodies, and we move ever closer to the big finish. This arc is more exciting than the last one, and it’s working for me. 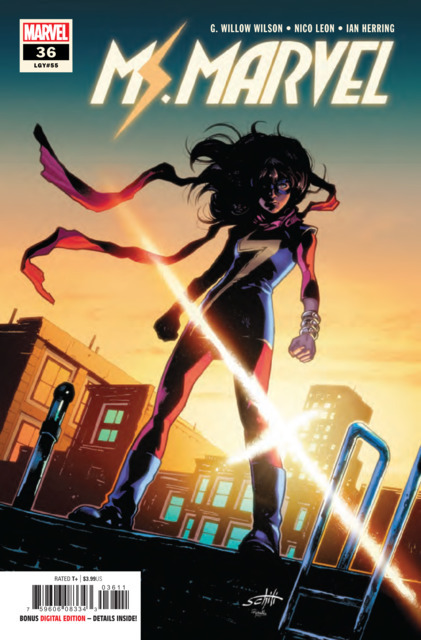 Ms. Marvel #31-36 – I only just recently learned that G. Willow Wilson was leaving this title, and at first I was sorry to hear that. Having gotten more or less caught up on the series, though, I can see that maybe it was time for her to move on. I feel like she’s managed to say a lot of what she wanted to say about Kamala, and when you end up devoting four issues to a fight with the Shocker, of all characters, it’s time to see that the writing is on the wall. Wilson has done something incredibly rare these days in creating a character that has become a fan favourite and is likely to be around for a very long time. Kamala is a loveable character, and a groundbreaking one. I’m curious to see what new writer Saladin Ahmed brings to her when this title relaunches soon. X-Men Blue #34-36 – I found that I never clicked with this series. I admire much of Cullen Bunn’s work, but things never felt right here. I find it hard to pinpoint what I didn’t like about his time lost original X-Men (much of the blame for the things I don’t like about these kids – flaming wings and magic powers – can be placed on earlier writers), but I really didn’t like where he took Magneto (which, granted, has already been dumped by the writers of Uncanny X-Men, not that they are doing better by him). This really felt like a placeholder series, as Marvel tried to figure out what to do with the kids. In the end, they did the best thing – they got rid of them.